Free Download AVS Video Editor 8.0.1.300 - Intuitive video editor for everyone. 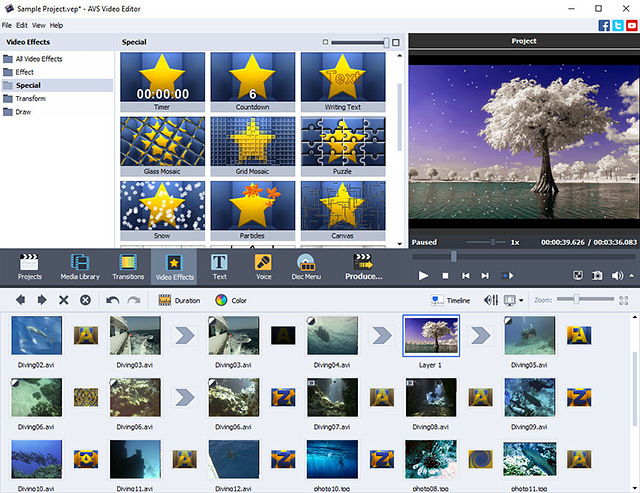 AVS Video Editor is an advanced, yet easy-to-use, tool for creating home movies. It supports virtually every existing video format. You can work with AVI (DivX, XviD, etc. ), MP4 (inc. Sony PSP and Apple iPod), WMV, 3GP, 3G2, QuickTime (MOV), SWF, DVD, VOB, VRO, MPEG 1,2,4, MPG, DAT, VCD, SVCD, MJPEG, Real Video (RM, RMVB). The program is capable of creating menus based on individual styles and of burning movies to DVD or CD. DVD, VCD, and SVCD formats are supported by built-in burner. Automatic scene detection algorithm will help you to navigate between different fragments of video and to edit the movie. At your service are over 300 transitions and special video effects to create a professionally looking movie, or an excellent slide show of your photos. AVS Video Editor not only opens any video file, it can also capture video from almost all possible sources: HDV/DV, micro DV, analog camcorders, TV tuners, Webcams, VCRs. Moreover, after editing you will be able to export resulted video to your favorite mobile device: Apple iPod, Sony PSP, Creative Zen Vision, Archos DVR, mobile phones, portable DVD players etc. The program offers intuitive interface, which makes even most complex tasks easy to accomplish.